MIAMISBURG — The Crestline Bulldogs football team may have had a Friday night off but they made the long trip down to Miamisburg on Saturday to clash with the hosting Dayton Christian Warriors. It would prove to be a rough trip for the ‘Dogs as they were blanked by their hosts to the tune of 26-0. With the defeat, Crestline falls to 1-3 on the season while Dayton Christian improves to 3-1. The Warriors would get on the board early in the first quarter thanks to a 15-yard touchdown pass but would fail to convert the two-point conversion to move ahead 6-0. For the remainder of the first and on through the second and third quarters, no points would be posted. In the fourth however, Dayton Christian would strike again for their second touchdown, this time on an eight-yard run and a converted two-point conversion. Now up by a score of 14-0, the Warriors would cross the goal line again on a lengthy run of 36 yards to stretch their advantage to 20-0 after another failed two point attempt. The Warriors final score would come on a 25-yard run to put the game at its eventual final score of 26-0. Crestline would manage just 255 yards of total offense on Saturday with the majority coming via the ground game. 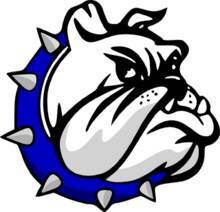 The Bulldogs posted 217 rushing yards rushing to just 38 yards passing against the Warriors defense. Ty Clark had a rough night under center for the ‘Dogs, completing just three of 18 pass attempts for those 38 yards while tossing two interceptions. Caleb Moore did post a large portion of the Crestline rushing yards, carrying the ball 17 times for 130. Dakota Wireman picked up 52 yards on seven carries and Ethan Clum ran to 35 yards on four carries to round out the ground attack. Wireman, Moore and Kaden Ronk all caught one pass apiece for the Bulldogs in the loss. Wireman’s catch was for 23 yards, Ronk’s for 14 yards and Moore’s for just a yard. On the defensive side of the ball, Crestline finished the contest with 10 tackles for a loss and Logan Parrella, Andrew Gundrum and Moore all recorded one sack apiece. Crestline will be back in action on Friday evening in week five action on their home field against the visiting Gates Mills Hawken Hawks. The Hawks are currently 0-4 on the season.